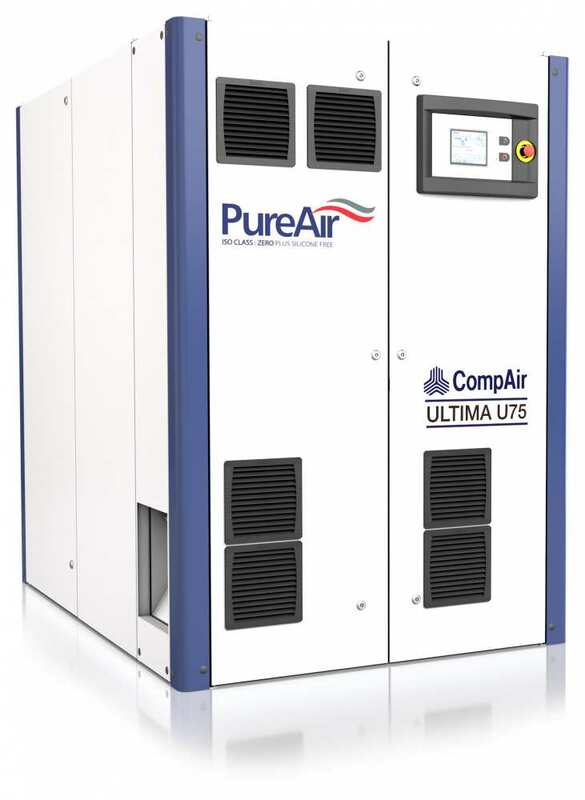 The U75 compressor belongs to the innovative Ultima range of compressors and is 100% oil and silicone free. The unique design utilises a low pressure and high pressure dry screw airend – each airend is individually driven by a variable speed, permanent magnet synchronous motor, offering exceptional levels of efficiency versus traditional oil-free technology. The design of Ultima combines the ultimate performance with the ultimate efficiency, and still delivers a footprint 37% smaller than a conventional two-stage oil-free compressor. CompAir‘s U75 compressor is extremely quiet with a noise level of only 69dB(A). This is a great benefit for customers who want to use compressors at point of use, eliminating the need for complicated and expensive pipework and even further maximising efficiency. By utilising the superior design of the closed loop water system, Ultima requires no air for internal cooling. Ultima processes cooling air within the compressor and utilising a heat exchanger, cools the internal air, then recirculates it via the base frame around the compressor. This also ensures that no dust or particulate can enter the inside of the compressor. As a result, installation is made easy with no requirement for ducting, compressor rooms can be kept to the minimum size, noise levels are greatly reduced and machines can be easily installed at point of use. The Delcos XXL control system ensures reliable operation and protects your investment by continuously monitoring the operational parameters, essential for reducing your running costs.